Are you tired of your outdated coffee equipment? If the answer is yes, you may consider the option to lease or rent coffee machines. In the UK, there are numerous sightings of ads about coffee machine contracts, examples are phrases like "coffee machine hire ","coffee machine for rent ", "coffee machine leasing" etc. Most of rental prices come between £8 and £15 per week for a quality machine. More affordable solutions though are available for those who want to drop even more the monthly costs. A detailed price overview of coffee machine leasing and/or renting can be seen below. The price is one of the obvious benefits of commercial coffee machine rentals. Coffee machine rental costs are particularly suitable for small and medium-sized businesses for shorter time periods. This is due to the fact that hiring a coffee machine does not require any liquidity. If you do have the budget to buy a tea and coffee vending machine, that might be more cost effective in a long term perspective. Often, investing in a coffee machine is a costly process, so a rental agreement can be an alternative to save money. Businesses also see renting coffee machines as a practical choice. In most cases, the coffee machine supplier takes care of maintenance and refilling. If you need customised quotes, then fill in the contact form and Market Inspector will provide you with up to four free, non-binding quotes to help you make a well-informed purchase. Opportunity to test out various machines, allowing you to find the unit that best suits your needs. Suppliers may offer training to users to ensure top quality beverages are produced. Financial freedom to invest in other areas of your business because there are no high upfront costs. The price of renting a coffee machine in the UK varies according to different factors. This includes the model of the machine, its performance, and its coffee output capabilities. A coffee machine that can only brew black coffee will cost less than a coffee machine rental which delivers more variations of coffee, such as lattes or cappuccinos. Find Your UK Coffee Machine Supplier Today! Which Type of Coffee Machine is the Best for Your Business? How Much Does It Cost to Hire a Coffee Machine? Type of coffee machine - A common customisable feature that will affect the price of a rented coffee machine considerably is the choice of bean over instant coffee, as it involves quite a bit of additional equipment. 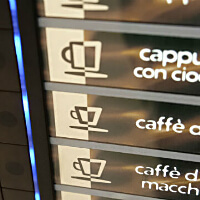 Range of drink options - The number of drink options are also going to affect the rental price for a commercial coffee machine. Simpler machines commonly offer between four and five options, while more expensive, customisable machines are able to crunch out 150 cups per day, while offering a range of eight or more drink options. Accordingly, the prices for such machines will probably range anywhere from £23-25 per week, as opposed to simpler models for £4-8 per week. Add-ons to your coffee machine - The more customised you need your coffee machine to be, the more you will have to pay for it. Coffee machine suppliers offer a magnitude of options customised to best suits your needs. Find Your UK Supplier and Hire Your Coffee Machine Today! Finding the right coffee machine supplier can take a lot of time. There is a large variety of machines to choose from, each with different performance outputs and functions. Compare coffee machine rental agreements and coffee machine contracts of various suppliers to get the best price. You want to find the best coffee machine for your business, right? Fill out the non-binding contact form to get professional advice and reviews on which commercial coffee machine suits you best. You get up to four free quotes after customer service has verified your enquiry. When deciding on a type of coffee machine lease, it is beneficial to consider how many consumers you wish to serve in a specific time period, be it in an hour or a day. Based on your specifications, it will be easier to narrow down your coffee machine rental research. Renting a bean to cup coffee machine is the ideal choice if you are looking for the freshest and highest quality coffee available for your employees. You can get an integrated coffee machine rental that fits nicely in your office kitchen or reception. Hiring a coffee vending machine is a convenient and ideal option for larger businesses or organisations. They serve a large volume of beverages with the simple push of a button, and can also come with other functionalities and can even double as regular water dispensers. Brand coffee machines to rent are considered to be the more likely to perform at higher standards, as these manufacturers may have a long history in the coffee brewing business and thus may build higher quality products. In any case, be it coffee machine rentals from Melitta, Krups, Gaggia, De’Longhi, Jura or Franke, a good cup of coffee should provide your staff with high quality coffee, necessary to kick-start the workday. Commercial coffee machines can be quite expensive, with prices ranging from £1,000 to £12,000 and even higher. Therefore, many customers opt for leasing a commercial coffee machine, instead of buying one outright. While the process of leasing a commercial coffee machine usually makes more sense from a cash flow point of view, one should also keep in mind that leasing a commercial coffee machine is usually tax deductible – unlike a direct acquisition. 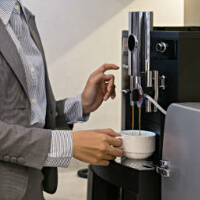 Generally, popular machine models being leased typically include bean to cup coffee machines, commercial espresso machines, and commercial filter coffee machines. Leases usually last for a period of one to five years, with a three year leasing period being the most commonly chosen duration. If you are interested in leasing a commercial coffee machine for your business, you should be aware that with a longer leasing period, the total costs will typically rise, while in return, monthly payments will decrease. Essentially, there are two different types of leasing agreements when it comes to coffee machines for hire: an operating lease and a finance lease. An operating lease is when the customer is not obligated to buy the product at the end of the contract, a process previously called hire-and-purchase. In most cases, operating leases are short-term deals that depend on the agreement reached between the supplier and the customer. This is a more flexible coffee machine leasing agreement, seeing as there is the opportunity to change machines. A finance lease is when the customer commits to buying the leased product at the end of the lease term, or commits to finding a buyer at the end of the contract. Depending on your arrangement, the supplier will either partially or fully manage, maintain, and restock your coffee machine rental. Therefore, leasing a coffee machine is often not as complicated as owning a machine. Leasing a coffee machine can sometimes lock you in a contract for many years. There may even be cancellation fees if you want to cancel the contract with the supplier before the set end date. Double check how often your supplier is supposed to visit for maintenance checks and restocking. These conditions need to be clearly defined in the contract in order to avoid surprises in terms of costs and logistics. By renting a coffee machine, the level of convenience, freedom, and flexibility increases, as all responsibility and service related work is mostly transferred over to the supplier. The suppliers offer free service and maintenance as part of the coffee machine rental agreement. In addition, they often take care of everything from installation of the coffee machine to teaching the staff how to use it. Companies are able to stay up to date, as the supplier is required to periodically provide them with the latest model as a part of the rental agreement. Renting coffee machines allows companies to test different options and find the one that best suits their needs. This helps them determine what type of coffee machine they should invest in in the future. Finally, companies are able to acquire a brand new coffee machine without any liquidity, as they simply need to sign the rental agreement. They are able to retain their cash flow and keep track of payments that are fixed and predictable. Coffee consumption in the UK is increasing in popularity over its rival, the traditional cup of tea. There has been a general rise in establishments which serve coffee. Coffee drinkers have slowly decreased their domestic coffee consumption, and have replaced this by coffee shop visits. Social gatherings often occur over coffee at local coffee shops, where both beverages and the ambience are built around catering to the needs of the consumers. The worldwide coffee trend has spread into the UK and has been welcomed as part of the everyday routine. Buying an industrial coffee machine for your coffee shop might be a cost you cannot afford. For this reason, renting a coffee machine is the preferred choice for many cafés. 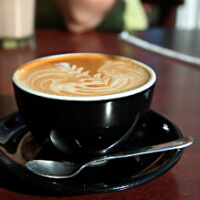 Usually, coffee shops prefer to use espresso coffee machines or bean to cup machines. However, filter coffee machines are also very common. These units are able to brew coffee drinks of the highest quality and can satisfy various preferences. There are numerous reasons for improving your office coffee. One, among them, is that many employees appreciate high quality coffee at their workplace. Good coffee allows them to get a good start in the morning but also keeps them awake and on alert throughout the day. How many cups of coffee will be consumed per day? What types of coffee do the employees prefer? Having a precise answer to these questions will aid with the decision making process and will lead you to the most suitable coffee machine solution for your office. If your office has a limited number of employees, a traditional coffee maker might do the trick. Due to the growing demand of variations of coffee, there are multiple types of coffee makers available for purchase. Are you Interested in Renting a Coffee Machine? Buying a coffee machine might be an impossible investment for your business. A coffee machine rental will allow you to have more flexibility with your financial plans. Furthermore, most suppliers offer full service as part of their rental agreements. Fill in the form today to learn about how Market Inspector can provide you with up to four free, non-binding quotes from qualified suppliers of high quality, coffee- and espresso machines.